Most building blocks in Chiang Mai need filling. The land where I built the house did have a previous concrete and brick dwelling on it. This had been demolished and only a small amount of rubbel was left. The land was about half a meter below the height of the crest of the road. Many to most of house lots in Chiang Mai are on old farming land which has a loamy soil that becomes boggy when wet. This soil might be two meters deep and not stable during the wet seasons. To build a stable house the footings were dug down to 2.4 meters below the top of the fill. The house is not sitting on the fill but the fill is needed to give a stable platform to build from and to adjust the height of the land. The land slopes slightly to the road after it was filled. I believe there are different grades of fill available, I see some dark blue road base being used in this area. The fill I used was a sandy clay with a lot of small to large stone, the largest being about 5 kilograms. This type of fill comes from the many quarries that are near the mountains at Hang Dong. A 5 ton excavator and a fleet of 4 ton tip trucks were employed.Somebody is needed to count the deliveries and write down how many times each truck delivers a load. This is so the boss can pay each owner driver separately. Don’t forget to have ice water and a cup ready for all workers. You may not need to have food available but a snack could be welcome for the drivers and machine operator. There is usually a boss looking after the money and might be a boss for the trucks and another for the excavator. You pay after the landfill is complete. When you get a price per load, make sure that delivery is in the price. Thais have a habit of thinking up different ways to make more money. The fill should not need watering unless it is dusty and annoying the neighbors. The fill does not need packing tight as the house is sitting on the foundations and not the fill. The fill will settle and the height will drop a little. Precautions should be taken to stop any slurry run off during wet weather. A few bales of hay spread across any water exit can hold the slurry. You will find the filling material will set like concrete almost in dry weather. When preparing to pour the ground floor and the beams for the ground floor, you don’t want the concrete sitting on top of compressed hard ground. Chiang Mai ( and other places ) does have earthquakes and you don’t want the ground pushing up and cracking the concrete. Best to have loose fill under the floor and beams so it will settle and leave a gap, the house is then sitting on the foundations only. 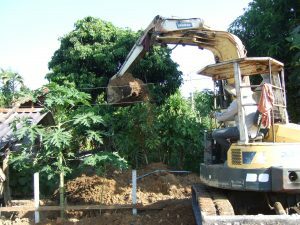 When the deliveries were almost finished, I asked the truck driver how much more fill was needed, I took his advice which was reasonable but found that I had to get about thirty tons of soil removed from the site while building the footings and foundations. This was my fault as the block is very small and there was nowhere to put the excess soil when the footings were dug. Luckily a next door neighbor needed soil in his garden and a lot of excess soil was moved over the fence. The soil that was moved into the next door garden was from down in the holes and not the hard imported fill.